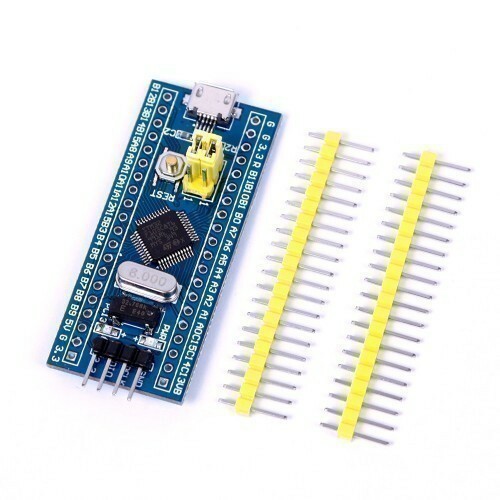 The Micro SD Card Adapter is a Micro SD card reader module, and the SPI interface via the file system driver, micro-controller system to complete the Micro SD card read and write files. Users can directly use the Arduino IDE comes with an SD card to complete the library card initialization and read-write. 72 MHz maximum frequency,1.25 DMIPS/MHz . 64 or 128 K bytes of Flash memory. 20 K bytes of SRAM. 2.0 to 3.6 V application supply and I/Os. Internal 8 MHz factory-trimmed RC. 32 kHz oscillator for RTC with calibration. 2 x 12-bit, 1μs A/D converters (up to 16 channels). Peripherals supported: timers, ADC, SPIs, I2Cs and USARTs. Up to 2 x I2C interfaces (SMBus/PMBus). Up to 3 USARTs (ISO 7816 interface, LIN, IrDA capability, modem control). Up to 2 SPIs (18 Mbit/s). CRC calculation unit, 96-bit unique ID. DIY Projects requiring ARM processing unit. Also Searched as: stm32f103c8t6 application, st microelectronics stm32f103c8t6, stm32f103c8t6 pin out, stm32f103c8t6 circuit, stm32f103c8t6 schematic, stm32f103c8t6 mcu, stm32f103rbt6 datasheet, stm32f103 datasheet pdf.